* Marker interface for fast-running tests. * Marker interface for slow-running tests. If you want to handle different test runs with different categories then one solution is to use maven profiles here. We’re defining one maven profile for the fast running tests – this one is enabled by default – and another for the slow running tests. These profiles allow you to select which test categories you’d like to run … in the first example we’re running with the default profile “fastTest“. Another viable option is to create a classic test suite and assign the test categories affected in there using annotations. This entry was posted on Thursday, December 6th, 2012 at 10:02 pm	and is filed under Java, testing. You can follow any responses to this entry through the RSS 2.0 feed. You can skip to the end and leave a response. Pinging is currently not allowed. 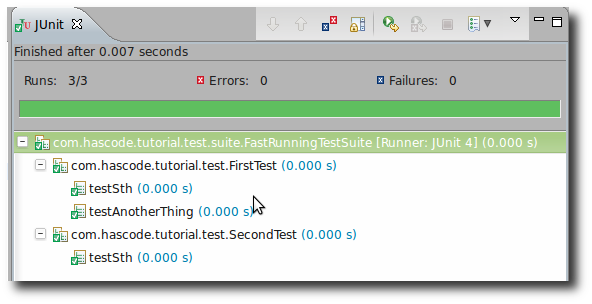 I was trying JUnit categories annotation with group parameter in maven surefire plugin to run Unit Tests or Integration Tests. It looks like the JUnit categories annotation doesnt work for method level tests, but only works for class level. Is there anything wrong with my configuration? See details below. from the stacktrace I can see that you’re using IntelliJ Idea .. I’m not able to reproduce your problem running the test with version 13.1 – perhaps you’re using an older version with an older internal version of jUnit installed (Settings > Plugins > jUnit)?